As the headline says, Follower is now part of Flattr! What on earth does that mean? Well, Flattr is a new way for creators like me to get support for their work, from the people who enjoy my content the most. It’s essentially a subscription account that automatically rewards sites you use frequently on a monthly basis, giving them support in an amount proportional to your usage. There’s an entire network of sites connected to Flattr, and now Follower is one of them. Find out more and subscribe to Flattr here! Meanwhile, we are also working on some additional new support options while we wait for the dust to settle on Patreon’s newly announced fee structure. We’ll be adding more to our Gumroad shop, and introducing some new subscription goodies. Watch for another news post here in the near future, or sign up for our newsletter to be notified when we’re ready to launch! It’s that time of year again! 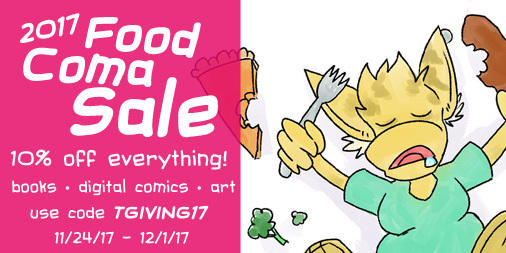 Now through December 1, 2017 get 10% off everything in our online shop when you use the code TGIVING17! This includes books in print, buttons and accessories, art, and everything else! If you sign up for our email newsletter, you’ll also get an extra coupon code you can use anytime! Happy post-Thanksgiving turkey coma, everyone! 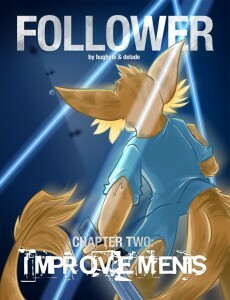 Follower Issue 2, now on comiXology!